This is the BMW M6 Gran Coupe. 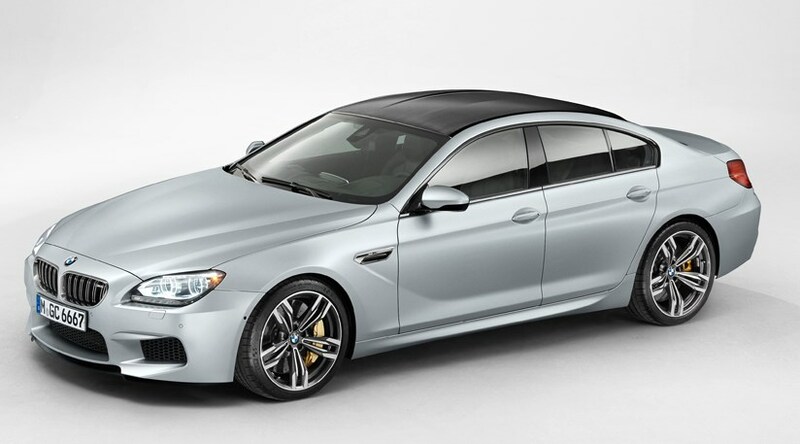 Matching the M6 coupe's twin-turbo powertrain to the 6-series Gran Coupe's slinky body, think of it as a sexier, slightly faster alternative to the three-box M5 saloon. The M6 Gran Coupe is on sale from 25 May 2013, after a Detroit motor show reveal in January. How fast is the new BMW M6 Gran Coupe? Given it shares its potent engine and twin-clutch gearbox with the M5 and M6, you'd expect the Gran Coupe to shift, and it does. Thanks to a 552bhp, 550lb ft bi-turbo 4.4-litre V8, 62mph is breached in 4.2sec (0.3sec ahead of the M5) and the top speed is limited to 155mph. Fitted as standard to the M6 Gran Coupe are 20-inch forged alloy wheels, and the gold brake callipers as seen in these pictures denote carbon-ceramic brake discs. The carbon discs are a whopping £7395 option on a two-door M6, but should stand up well to the abuse of hauling the hefty M6 Gran Coupe to a standstill. Those large wheels are shod with chunky 295/30 ZR20 Michelin Pilot Super Sports for improved traction to cope with all that grunt. With a driver on board and the car fuelled, the M6 Gran Coupe weighs in at around 1950kg (100kg up on the M6 Coupe, thanks to the longer body and double the door count). The front and rear bumpers get an M Division redesign, and quad exhausts poke out the rear. The bumper-integrated rear diffuser is made from carbonfibre, as is the roof panel. Inside, there are heated sport seats, climate control, a head-up display, the obligatory red/navy/blue stitching, and extra badging to set the flagship Gran Coupe apart. BMW's official price for the M6 Gran Coupe is £97,490. That's £3670 up on a two-door M6 coupe, and a hefty £24,425 more than an M5.